March 27, 2017, 2:05 p.m.
A popularly held concept is that food that has fallen on the floor is good to eat so long as it is picked up quickly. Science suggests this is not strictly true – dropped food does get contaminated, but the less time spent on the floor the less bacteria is picked up. Now new YouGov research finds that the threat of germs is unlikely to stop Brits from dusting off fallen food, with nearly six in ten Brits (58%) stating they are happy to eat food from the floors at home. However, there is no clear agreement about how long people would leave food on the floor for and still be happy to eat it. 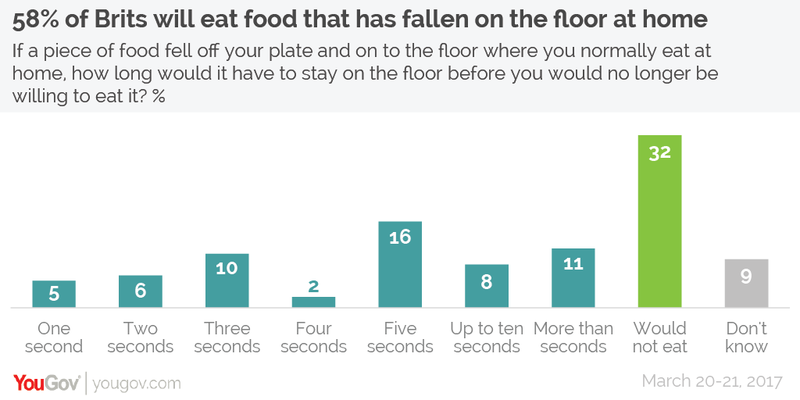 While one in six (16%) Brits adopt the “five second rule”, and one in ten (10%) adopt the “three second rule”, 11% are happy to consume food that has been on the floor for more than ten seconds. By contrast, nearly a third (32%) of Brits don’t want any part of it, refusing outright to eat any food that has fallen on the floor at home. Willingness to eat food that has fallen on the floor declines with age. More than four in ten (42%) Brits aged 65+ wouldn’t be prepared to eat food that had fallen on the floor, compared to under a quarter (23%) of 18-24 year olds. This could simply be a reflection that the “five second rule” may be a relatively recent invention, or that younger people are simply less fussy.